The Detroit Tigers visit Progressive Field on Friday, July 7, 2017 to play the Cleveland Indians. The probable starters are Jordan Zimmermann for the Tigers and Carlos Carrasco for the Indians. The opening line for this matchup has Detroit at +203 and Cleveland at -220. The Tigers have a 43-35-5 over/under record and a 40-43-0 run line mark. The Indians are 35-48-0 against the run line and have a 29-49-5 over/under record. The Tigers have a 37-46 overall record this season. Starting pitcher Jordan Zimmermann has a 5-6 record with an earned run average of 5.58 and a WHIP of 1.47. He has 65 strikeouts over his 92 innings pitched and he's given up 106 hits. He allows 10.4 hits per 9 innings and he has a FIP of 5.78. The bullpen has an earned run average of 5.11 and they have given up 251 base hits on the year. Teams are hitting .255 against the bullpen and they've struck out 229 hitters and walked 111 batters. As a team, Detroit allows 9.4 hits per nine innings while striking out 7.7 batters per nine innings. They are 27th in the league in team earned run average at 4.87. The Tigers pitchers collectively have given up 762 base hits and 394 earned runs. They have allowed 106 home runs this season, ranking them 13th in the league. Detroit as a pitching staff has walked 283 batters and struck out 621. They have walked 3.5 men per 9 innings while striking out 7.7 per 9. They have a team WHIP of 1.43 and their FIP as a unit is 4.62. As a team Detroit is hitting .255, good for 15th in the league. The Tigers hold a .429 team slugging percentage and an on-base percentage of .328, which is good for 11th in baseball. They rank 16th in MLB with 8.7 hits per game. Miguel Cabrera is hitting .266 with an on-base percentage of .359. He has 69 hits this season in 259 at bats with 39 runs batted in. He has a slugging percentage of .452 and an OPS+ of 117. Justin Upton is hitting .271 this year and he has an on-base percentage of .355. He has totaled 75 hits and he has driven in 54 men in 277 at bats. His OPS+ is 128 while his slugging percentage is at .505. The Tigers have 719 hits, including 151 doubles and 103 home runs. Detroit has walked 287 times so far this season and they have struck out 689 times as a unit. They have left 565 men on base and have a team OPS of .757. They score 4.77 runs per contest and have scored a total of 396 runs this year. Cleveland has a 44-39 overall mark this year. With an earned run average of 3.50, Carlos Carrasco has a 9-3 record and a 1.06 WHIP. He has 103 strikeouts over the 97.2 innings he's pitched. He's also given up 77 hits. He allows 7.1 hits per nine innings and his FIP stands at 3.62. The bullpen has an earned run average of 2.83 and they have given up 211 base hits on the year. Teams are hitting .219 against the Indians bullpen. Their relievers have struck out 301 batters and walked 85 opposing hitters. As a team, Cleveland allows 8.2 hits per nine innings while striking out 10.1 batters per nine innings. They are 4th in the league in team earned run average at 3.86. The Indians pitchers as a team have surrendered 664 base knocks and 314 earned runs this season. They have given up 96 home runs this year, which ranks 24th in Major League Baseball. Cleveland as a staff has walked 234 hitters and struck out 822 batters. They give up a walk 2.9 times per 9 innings while they strike out 10.1 per 9. Their team WHIP is 1.23 while their FIP as a staff is 3.67. As a team, they are batting .259, good for 12th in the league. The Indians hold a .433 team slugging percentage and an on-base percentage of .333, which is good for 6th in baseball. They rank 13th in MLB with 8.8 hits per contest. 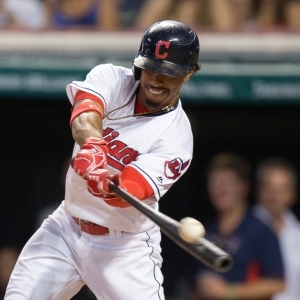 Francisco Lindor comes into this matchup batting .252 with an OBP of .312. He has 83 hits this year along with 40 RBI in 330 AB's. He maintains a slugging percentage of .461 with an OPS+ of 96. Edwin Encarnacion is hitting .257 this season and he has an OBP of .371. He has collected 75 hits in 292 at bats while driving in 45 runs. He has an OPS+ of 115 and a slugging percentage of .469. The Indians as a unit have 727 base hits, including 173 doubles and 97 homers. Cleveland has walked 302 times this year and they have struck out on 591 occasions. They have had 588 men left on base and have an OPS of .766. They have scored 4.72 runs per game and totaled 392 runs this season. Who will win tonight's Tigers/Indians MLB game against the spread?